Black Lotus Casino offers its players a number of great casino promotions each month. In addition to Party Favors and other promos, the casino added Money or the Box for extra weekly prizes. How Does the Money or the Box Work? Every single Tuesday, you get the chance to win additional prizes. Real money players at Black Lotus Casino stand the chance of winning. On Tuesdays, the casino holds a draw to select a number of qualifying players. Once your name is picked, you can expect a call from the Customer Support team on the same day. When the Support team call you, you need to choose one out of 52 boxes. However, you can also accept a cash offer rather than choosing the mystery box. Since the contents of the mystery boxes are unknown, you need to choose what you prefer. The box could contain a great prize or it could contain a booby prize. Some of the top quality prizes hidden in the boxes includes casino bonus funds, vouchers, and free spins. There is even a $5,000 cash prize hidden in one of the boxes. If you are one of the lucky Tuesday picks, what would you choose? How can you increase your chances of selection for the Money or the Box? The casino picks players randomly from those who are active in the casino. The more you play, the greater your chance of getting the call from Customer Support. 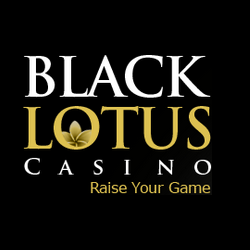 Whether the casino picks you for Money or the Box or not, you still get to enjoy other great Black Lotus promotions. There are three hours of Happy Hour each day between 6am and 9am EDT. Why enjoy just one Happy Hour when you can enjoy three! During the Happy Hours, you simply need to make a deposit and you get 50 free spins. Play the free spins on the casino’s best games. Make the Happy Hour promotion even better, by joining in the fun each day for seven days in a row. When you play for seven consecutive days, Black Lotus Casino enters you into a special lucky draw. Prizes include a gift basket, extra free spins, a voucher, and bonus money. All qualifying players stand the chance of winning one of these weekly prizes. Contact the casino via the Live Chat option for the Happy Hour code of the day.